Patty McCarthy Metcalf, M.S., is the Executive Director of Faces & Voices of Recovery, the nation's leading recovery advocacy organization since 2001. Her work focuses on public policy, public education, community mobilizing, peer-based recovery support services and peer workforce development. She has been instrumental in the development of national accreditation standards for peer recovery support service. Patty has designed and delivered training on topics such as recovery messaging, ethics and boundaries, recovery-oriented systems of care (ROSC), peer recovery coaching and much more. As a woman in long-term recovery from alcohol and drug addiction since 1989, Ms. McCarthy-Metcalf has frequently participated as a subject matter expert and thought leader with SAMHSA sponsored policy discussions. Prior to joining Faces & Voices of Recovery, Patty served as a Deputy Director of SAMHSA’s Bringing Recovery Supports to Scale Technical Assistance Center Strategy (BRSS TACS) initiative. She served for a decade as the Director of Friends of Recovery-Vermont (FOR-VT), a statewide recovery community organization promoting the power of long-term recovery to improve the health and quality of life of Vermonters. Ms. McCarthy Metcalf’s professional experience covers the spectrum of prevention, treatment and recovery. She has worked as a substance abuse prevention specialist with the Vermont Department of Health and as a Child and Family Clinician within a community-based mental health center. She holds a Master’s Degree in Community Counseling and a Bachelor’s Degree in Business Administration. Recovery from alcohol and other drug addiction is one of the most courageous and empowering processes one can undergo in their lifetime. Our collective strength across the world is built by the contributions, big or small, made by each individual’s recovery experience. 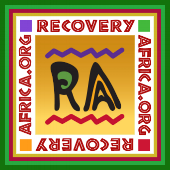 The recovery movement lives and grows through Recovery Africa as the organizing force behind the movement in Ghana. I am so honored to be witnessing and supporting the excellent work of Recovery Africa.